Rebecca Hart and Schroeter’s Romani. Photo (c)SusanJStickle.com. Katy, Texas – November 3, 2015 – Accomplished Grade III athlete Rebecca Hart once again took home the USEF Para-Equestrian Dressage High Performance National Championship. Hart maintained the lead over a large field of competitors at the 2015 Championship earning the Leading Athlete award. She also topped the ranks of Grade II in the Katy, Texas CPEDI3* event. Hart is a two-time Paralympian (2008, 2012) and two-time World Equestrian Games athlete (2010, 2014). Annie Peavy earned the 2015 USEF Para-Equestrian High Performance Dressage Reserve Championship with Ozzy Cooper, owned by Rebecca Reno. Winning the 2015 National Para-Equestrian Dressage Championship was Kate Shoemaker and her own Solitaer 40. Kelly Boccia and her own Donauwalzer CSF won the Reserve National Championship. Running concurrently with the National Championship was the Katy, Texas CPEDI3* and CPEDI1*, October 30 – November 1, at the Great Southwest Equestrian Center. Para-Dressage athletes in Grade Ia, Ib, II, III, and IV competed in front of CPEDI ground jury President David Schmutz 4* USA, Eva Maria Bachinger 5* AUS, Gudrun Hofinga 5* GER, Sarah Leitch 5* GBR, and Kristi Wysocki 4* USA, with national judges David Schmutz, “S”, Kristi Wysocki, “S”, and Susan Mandas, “S”. Following a successful Championship, riders will next head to Wellington, Florida for the 2016 Para-Dressage shows at the Adequan Global Dressage Festival. The weekend went well for Rebecca Hart and her partner, Danish Warmblood Schroeter’s Romani, owned by Rebecca Hart in conjunction with Margaret Duprey, Cherry Knoll Farm, Sycamore Station Equine Division, Barbara Summer, The Ruffolos, and Bill and Sandy Kimmel. In addition to winning the High Performance Championship and earning the Leading Athlete Award, the duo topped the Grade II CPEDI3*.The pair has been campaigning around the world perfecting their tests and earning valuable feedback from judges across Europe. This championship showed Hart that even after a top score she felt Schroeter’s Romani could give even more. She noted, “Having a 74 and finding there is more to get out of her is a great feeling.” They completed the weekend with a Freestyle score of 77.650%. World Equestrian Games athlete Annie Peavy and Rebeca Reno’s nine-year-old Trakehner Ozzy Cooper took home the 2015 USEF High Performance Para-Equestrian Dressage Reserve National Championship. For the USEF Para-Equestrian Dressage National Championship Kate Shoemaker and her own eight-year-old Hanoverian, Solitaer 40 earned the Championship while Kelly Boccia and her own Rheinlander Stallion Donauwalzer CSF garnered the Reserve Championship. Riders also competed as a team in the CPEDI3* and CPEDI1*. The USA teams were led by Chef d’Equipe Kai Handt. 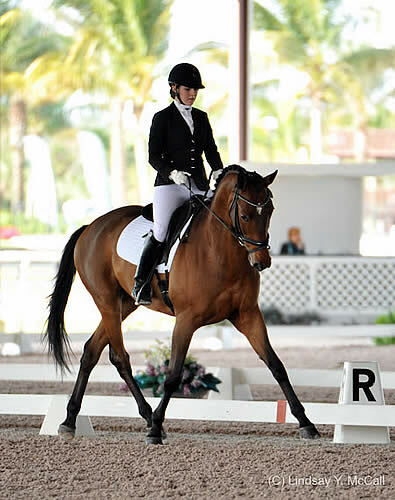 The CPEDI3* USA Team included Grade Ia athlete Roxanne Trunnell and Royal Dancer; Margaret McIntosh and Rio Rio in Grade Ia; Sydney Collier and Wentworth for Grade Ib, Rebecca Hart and Schroeter’s Romani in Grade II*, and reserve position Grade III rider Angela Peavy and Ozzy Cooper. The CPEDI 1 * USA Team included Grade III riders: Eleanor Brimmer and London Swing; Lara Oles and Bella; Kate Shoemaker and Dachstein; Kelly Boccia and Donauwalzer CSF in Grade II; and reserve rider Pamela Hardin and Quaterjack in Grade III. The CPEDI3* Team scored a 424.764 while the CPEDI1* scored a 402.240. Riders from Grade Ia, Ib, II, III, and IV competed for multiple accolades including the supreme title of National Champion, Leading Athlete, Grade Champion, and the Lloyd Landkamer Memorial Sportsmanship Award. Earning the Lloyd Landkamer Memorial Sportsmanship Award was National Championship winner Kate Shoemaker. The Lloyd Landkamer Memorial Sportsmanship is awarded at the USEF Para Equestrian National Championship each year. The Lloyd Landkamer Memorial Sportsmanship Trophy is to be awarded annually to the Para-Dressage Athlete competing at the USEF Para Dressage National Championship who best personifies the high standards and virtues of integrity, sportsmanship, honor, courage, team spirit, good temper and unselfishness. This award is selected through the organizing committee and officials of the competition. They may nominate up to three competitors exemplifying the award definition the day before the final awards ceremony. The athletes participating in the event vote for the winner (one vote per athlete) once the slate has been announced. The winner shall be presented the award during the final awards ceremony. The Perpetual Trophy will be engraved with the annual winner’s plate and maintained by the USEF. A take-home trophy will be given to the recipient of this coveted award. This award was first given in 2014 to Marsha Cullen. Following a successful 2015 USEF Para-Equestrian Dressage National Championship, international Para-Dressage athletes will next compete at the Adequan Global Dressage Festival in Wellington, Florida, in January 2016.